Mary Jane Topp Greene, 79, of Greensboro passed away peacefully on November 4, 2018 at Trellis Supportive Care’s Kate B. Reynolds Hospice Home in Winston-Salem. She is survived by her husband of 58 years, Jerry Greene, Sr.; her son Jerry Greene, Jr. and wife Leslie of Winston-Salem; and daughter Deborah Casstevens and husband Randy, also of Winston-Salem. In addition, she was an awesome “Nana” to her four grandsons and two great grandchildren who also survive: Dr. Matt Greene, wife Lindsay and their children Kayla and Logan of Minot, ND; Aaron Greene and wife Annie of Charlotte; and Ben and William Casstevens of Winston-Salem. She was preceded in death by her parents, Alice and Shelby Topp, Jr. and by her three siblings Evelyn McPherson, James Topp and Vivian LaCoste. Mary Jane was born in Jackson, MS on August 9, 1939. She graduated from Woodlawn High School in Birmingham, AL and attended the University of Alabama at Birmingham. Mary Jane and Jerry, Sr. were married on February 20, 1960. They lived in Birmingham, Atlanta, Greensboro, Brockville, ON Canada before returning to and settling in Greensboro in 1976, making lifelong friends along the way. Mary Jane was an avid and accomplished tennis player. 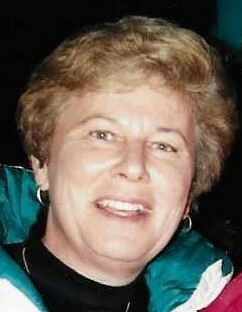 She served as the Western Guilford High School tennis coach and instructor at The Cardinal Country Club. Her skill, patience and demeanor made her a favorite of her tennis partners and students alike. Mary Jane was also a real estate broker and served her clients well. Mary Jane was a devoted wife, mother, mother-in-law, Nana and friend. She and Jerry had a wonderful marriage and together enjoyed traveling, walking the beach, going out to dinner with friends, attending concerts and Broadway plays, and going to sporting events. Mary Jane never met a stranger and loved all her friends…and there were so many. She had a playful competitive streak that quickly became evident whether she was on the tennis court, playing board games or card games, working puzzles or perhaps one of her favorite past-times: yo-yo tricks. She had a way of making all those she was with feel special, loved and important…even after beating them, which she did with regularity, at almost any game or activity that any one wanted to play. Mary Jane attended countless soccer games and baseball games played by her grandsons and enjoyed every moment while never wavering that in her eyes, each grandson was the MVP of every game. Her battle with Parkinson’s Disease was lengthy and difficult at times but she brought the same competitive spirit to fighting it that she brought to so many other facets of her life. She was provided great care by many friends and caregivers. Special thanks are extended to Nichole Johnson, James Davis and Cheryl Smiley of Trellis Supportive Care. In the end, Parkinson’s did not win because as a woman of deep faith, Mary Jane knew: I have fought the good fight, I have finished the race, I have kept the faith. She has been an inspiration to us all. Mary Jane was an active member of Westminster Presbyterian Church in Greensboro. A memorial service will be held on Sunday, November 11, 2018 at 2PM at Westminster Presbyterian Church, 3906 W Friendly Avenue, Greensboro, NC 27410. The family will receive friends following the service in the church fellowship hall. In lieu of flowers, please consider making donations to Trellis Supportive Care, 101 Hospice Lane, Winston-Salem, NC 27103, to Westminster Presbyterian Church or to the charity of the donor’s choice. Arrangements are entrusted to Triad Cremation & Funeral Service of Greensboro.